Welcoming him home — Hildegarde Naughton, TD, Richard Hayes, and his dad, Michael Hayes. 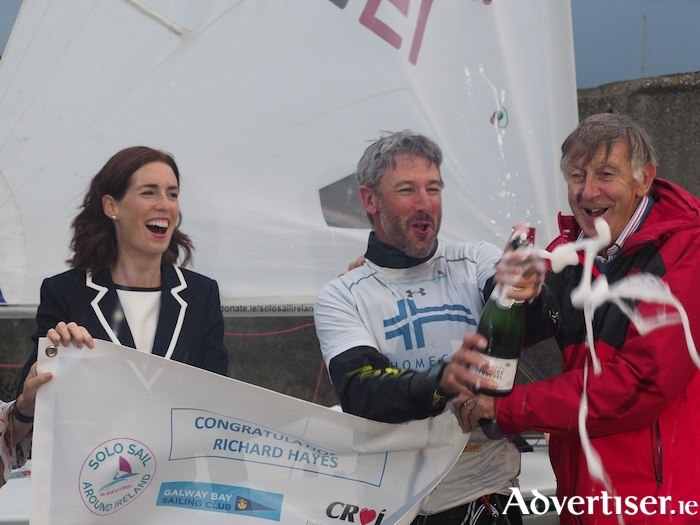 Galway Bay Sailing Club (GBSC ) member Richard Hayes has completed an arduous solo sail around Ireland in a Laser dinghy. Beginning the journey on May 27, Mr Hayes completed the journey in 54 days in one of the smallest boats ever to circumnavigate Ireland and did so successfully without a support team on the water. Mr Hayes undertook the journey in order to raise funds for Croí Heart & Stroke Charity, specifically to fund defibrillators in areas most needed in the community and support Croi in preventing cardiovascular disease and stroke. He was faced with numerous challenges along the way, such as a heatwave with no wind, storms Hector and Ernesto, lingering fog, and several weather warnings, all making the voyage take longer than expected. A flotilla of boats were out to meet Mr Hayes last Friday evening as he returned to GBSC, having sailed more than 2,452km (1,324 nautical miles ).